Maybe you are thinking, “that guy has a lot of shoes”. And you would be right. I have a lot of shoes. Many shoes. And I wear them. Everyday. Shoes everyday. That said, I don’t have as many shoes as Kobe. 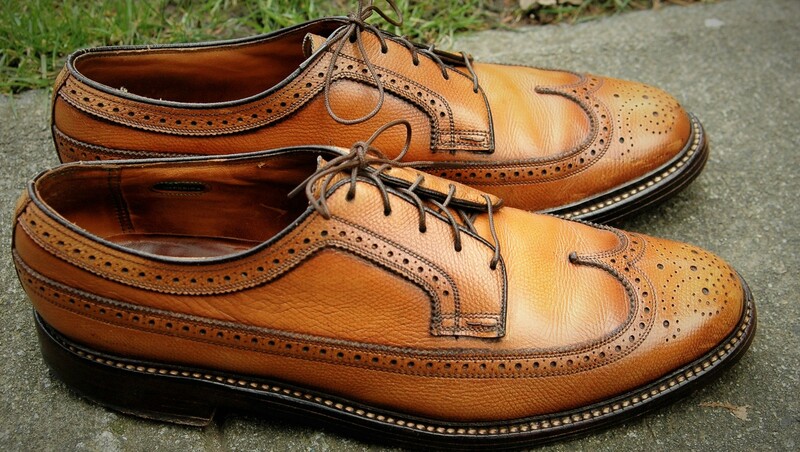 I would have gifted Kobe a complete set of NOS Florsheim Imperial shoes. Why not? The set would have included a pair in Golden Harvest (model 93631), like the ones photographed here. 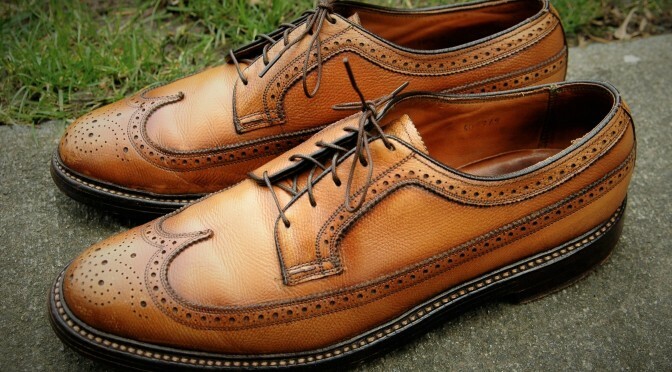 I believe Florsheim produced this model during the 1960s and 1970s but the color is very 1970s. They are sort of a mustard yellow. You can imagine Dave Winfield wearing a pair. The color can vary for this model. I have seen a few pairs that are a yellowish white in color. The lighter pair in this post is from 1970s. The darker pair, is from the 1960s. This is an uncommon model but not rare. There are usually a few pairs for sale on eBay at any given time but it will take some patience to find a pair in your size. Expect to pay around $65 to $150 for a pair (plus shipping). Want a new pair (NOS)? I have only seen one on eBay in the past year so don’t hold your breath for a new pair. Compared to a brown or black Florsheim Imperial, you will get noticed in a pair of these shoes. 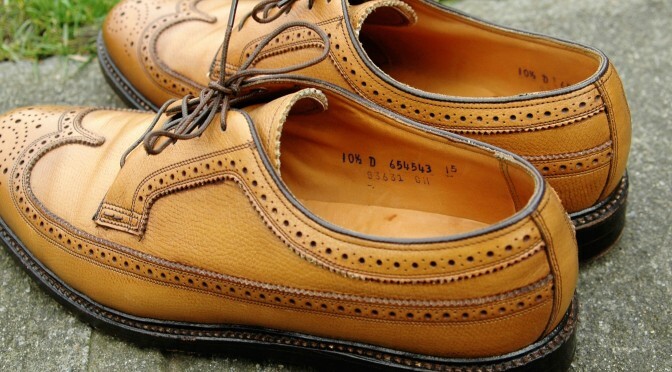 Yes, people notice mustard wingtips. Hi, I have recently been lucky to be able to purchase a pair of 93630 NOS perfect v cleats, LWT, Florisheim shoes with the code FF 498965. I need to warn all reader of this super blog that due to th age of these fantastic vintage American shoes you need to treat the leather ASAP. As the leather drys out over time even thou these shoe had been stored with cedar shoe trees. I did not do this simple treatment process and have paid the price as the leather cracked at the crease areas within hours of wearing. Subsequently I have trie to treat the leather but unreversable damage has been caused. Any ideas? That’s an awful story. But I am glad you shared the advice. I haven’t had any luck repairing cracked leather. 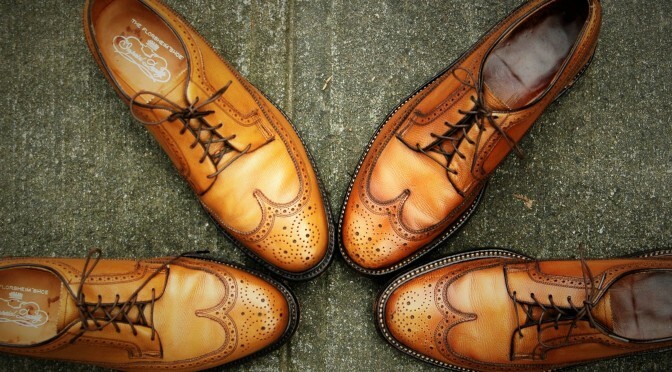 A good source of advice is posting some pictures on the Styleforum shoe care thread. 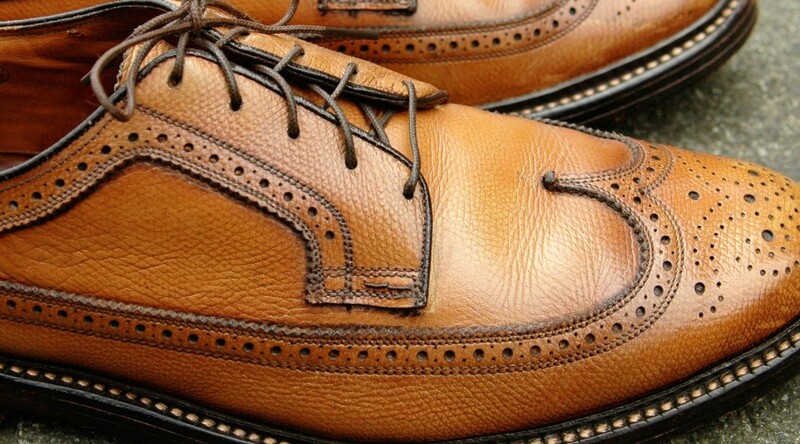 There are some very knowledgable shoe care experts watching that thread. David, I was just fortunate to have recently found a pair of these in my size. That color/brand polish do you use on these? Mine seem to be more on the pale yellow/tan end of the spectrum. Thank you for the information! 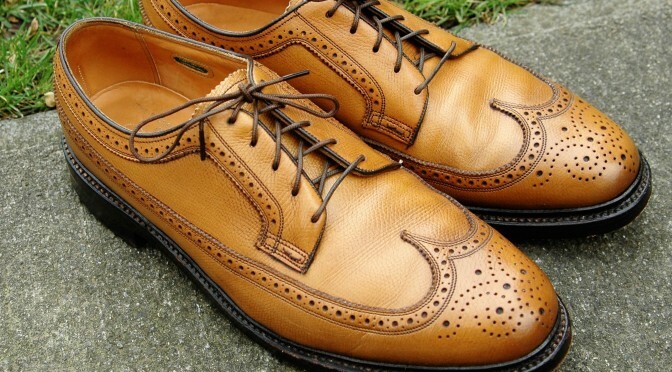 I have these shoes but they have a different style bottom. Instead of the VCleat there is a larger half moon metal piece on the outside heel corner. Do you have anymore information on that? Thanks for the help! Probably re-heeled at some point. The leather and vcleat is very slippery on wet concrete and tile floors!! I can’t imagine finding an affordable (for me) pair of Florsheim Imperial Golden Harvest’s so I’m wondering if anyone knows if Sears (or similar company) made a less expensive similarly colored shoe? I haven’t seen a Sears version but I believe Hanover made a similar color at one point. Sometimes the Florsheim version in good shape sells for $60 to $80 but they are rare.